KRS-One at Cholla High Magnet School. Yesterday, I said there was a rumor going around that rapper and activist KRS-One planned on visiting Cholla High Magnet School today, since he was in town for a concert last night at the Rialto Theatre. Well, that came true. KRS-One was at Cholla today and spoke at an assembly. Several dozen students walked into Cholla Magnet High School's Little Theatre Wednesday afternoon eager to meet a legend of Hip Hop music. What they didn't know is that they'd get a lesson not just about music but life-changing lessons in self esteem, knowing themselves and advice on how to live a successful life. How the internationally known star ended up lecturing to them in Tucson starts with a teacher in one of Tucson Unified School District's Culturally Relevant Curriculum courses. Mr. Andrew Walanski used KRS-One's "Introduction to Hip Hop" in his classroom at Cholla. Former State Superintendent of Public Instruction John Huppenthal singled the lesson out as one his department felt violated a state law. Media coverage of the letter sent by Huppenthal on his last day in office reached across the country to KRS-One and his team. KRS-One just happened to be coming to Tucson a few weeks later. He invited the students and teachers to be his guests at his concert at the Rialto, and conversations there led to an impromptu lecture at the school the following day. If you Google KRS-One and his background you'll find he gives lectures on college campuses across the country including Harvard and Yale. He's often referred to as the conscience of Hip Hop and a master teacher. At Cholla, while KRS-One gave a lecture on the origins of Hip Hop and how it connected to his life and his success, it was more about philosophy of self worth. 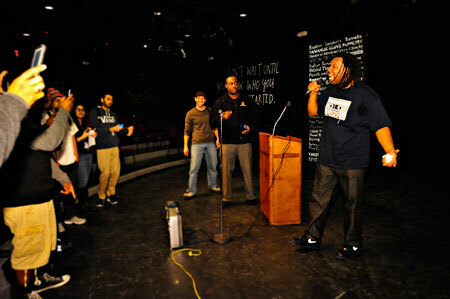 KRS-One encouraged the students to know themselves and "chisel out who you are." The 50-year-old also told the students to build each other up along with everyone else they know. "When you feel great, you see others as great and you add value. Lift them up and show other cultures how great your culture is," he said. The students were on the edges of their seats, paying attention to every word for the nearly three-hour session. Lorenzo Lopez Jr., TUSD's Coordinator for Culturally Relevant Pedagogy and Instruction, says that's what ethnic studies courses bring to the classroom. "His presence sums up what CRC [Culturally Relevant Courses] are all about. The educational experience adjusts itself to the needs of the students," he said. "The relevancy of having this internationally known artist in their school brings the educational experience to life. These students are life long learners engaged in the process of learning through thought and analysis." KRS-One told the audience, "You should be proud of your school for doing this." Tucson Unified School District Superintendent, Dr. H.T. SÃ¡nchez has expressed his support for using music in the classroom since the letter from Mr. Huppenthal was issued in December. "Music bridges generational gaps and is able to show students that certain struggles aren't new to this generation but transcend generations. Any media that does that is appropriate as long as it is suitable for the age of our students." At the end of the lecture and Q&A session, the artist posed for pictures and selfies with the students and teachers. He also shook every hand, telling the students he was honored to meet them and be there. An impromptu Hip Hop session and break dancing party also broke out while the students pulled out their cell phones to record the personal concert in the Little Theatre in their little part of the world. A young man named Dyre said he is an aspiring rapper. He said hearing from KRS-One and how he became who he is was inspiring. "It was great to learn to be confident in myself," Dyre said. Another student, Haley, says the experience will stick with her. "This school has given me so many amazing opportunities." What does Mr. Walanski want his students to take away from the visit? "I hope they all heard the message. Hopefully it means be confident in who you are. You choose how you move in the world. You can choose it." Cholla Magnet High School Principal Frank Armenta says, "This is what teaching is all about. Now their job is to take it from here and move it on. It's a global community, and it can start here and go worldwide." And it will. KRS-One was set to play for a sold out crowd in Barcelona, Spain, on Thursday.